Auto Service Neon Sign - You might have noticed this design in several of our other designs, that’s because it’s a very popular design that people love. 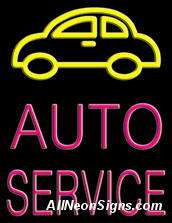 With the softer glow of the simple lettering, to the brilliant shine of the automobile, this neon Auto Service sign is sure to get drivers into your bays for the services and scheduled maintenance their cars are needing. It’s large and bright enough to get noticed on a wall or in the window, so don’t be surprised if you hear tires squealing as passersby hit the brakes to come in and see you.